Nobo T-Card Planning Panel With 32 Slot Capacity Metal Size 2 32938880 Pack of 1 Nobo T-Card Panels. Silver Grey panels that hold T shaped colour coded cards whose visible tag-tops carry a bold heading while concealed portion of each card contains information. Each panel has 32 slots (H714mm) and accepts Size-B (64mm) T-Cards. Nobo T-Card Planning Panel With 54 Slot Capacity Metal Size 2 32938881 Pack of 1 Nobo T-Card Panels. Silver Grey panels that hold T shaped colour coded cards whose visible tag-tops carry a bold heading while concealed portion of each card contains information. Each panel has 54 slots (H940mm) and accepts Size-B (64mm) T-Cards. 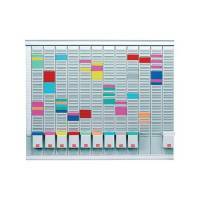 Nobo T-Card Planning Panel With 54 Slot Capacity Metal Size 3 32938884 Pack of 1 Nobo T-Card Panels. Silver Grey panels that hold T shaped colour coded cards whose visible tag-tops carry a bold heading while concealed portion of each card contains information. Each panel has 54 slots (H940mm) and accepts Size-C (95mm) T-Cards. 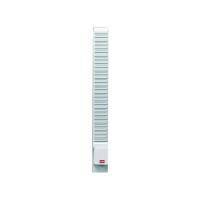 Nobo T-Card Planning Panel With 32 Slot Capacity Metal Size 4 32938886 Pack of 1 Nobo T-Card Panels. Silver Grey panels that hold T shaped colour coded cards whose visible tag-tops carry a bold heading while concealed portion of each card contains information. Each panel has 32 slots (H714mm) and accepts Size-D (127mm) T-Cards. Nobo T-Card Planning Panel With 54 Slot Capacity Metal Size 4 32938887 Pack of 1 Nobo T-Card Panels. Silver Grey panels that hold T shaped colour coded cards whose visible tag-tops carry a bold heading while concealed portion of each card contains information. Each panel has 54 slots (H940mm) and accepts Size-D (127mm) T-Cards. 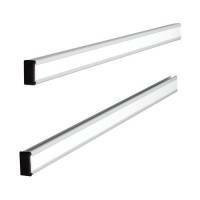 Nobo T-Card Planning Metal Link Bars 388x13mm Size 12 (Pack of 2) 32938888 Pack of 1 Nobo T-Card Panel Tracking. Grey panel tracking that is required to fix T-Card panels in place. Supplied in pairs. Size: 288mm. 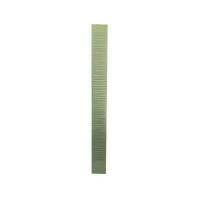 Nobo T-Card Planning Metal Link Bars 772x13mm Size 24 32938888 Pack of 1 Nobo T-Card Panel Tracking. Grey panel tracking that is required to fix T-Card panels in place. Supplied in pairs. Size: 772mm. Nobo 12 T-Card Panel Maxi Office Planning Kit 800x730mm 32938864 Pack of 1 "A complete system for monthly or annual planning. Fully supplied with accessories and a mini-planner to allow you to take your information along when travelling. Perpetual planner for size 1,5 t-cards. Kit of 12 size 1,5 32 slot panels and 1-31 printed"